Mamie Lebbi was the first person to have Ebola in Sierra Leone. This is the story of how she survived. She talked to Moses F James. Mamie Lebbi lives in Sokoma and she was the first person to have Ebola in Sierra Leone. She was also one of the first to survive. She sits for the interview and looks annoyed. She is a slim, strong woman in her early forties. Her husband watches. He is smaller and looks more friendly. For some reason, she did not receive a ‘survivor’s certificate’ that gives good, free healthcare and money. And she is tired of interviews. She is now looking after three children from families who died from Ebola, and five children of her own. When Ebola came, it was new to us. That’s why so many people died. My best friend Siawanda had Ebola from a small village called Kpundo near here. She is free and open with everybody, so she helped to wash the body of a friend that died in Guinea. Then she got sick. Everyone who touched Siawanda died: her aunty, three of her children, and all of her doctors. 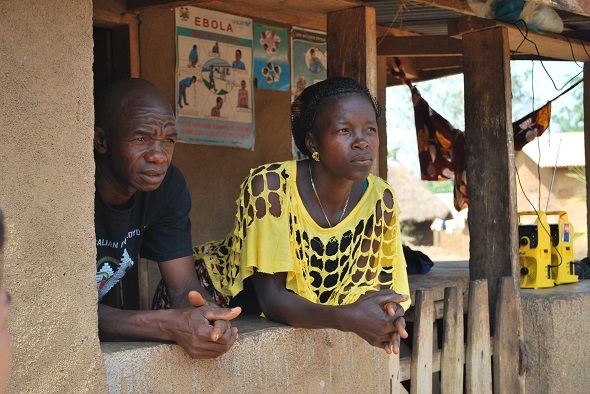 Her eldest daughter brought Ebola back to Sierra Leone. Soon, people were dying everywhere and no-one knew why. People thought it was cholera and no-one was vomiting blood like on the government Ebola posters. My husband’s sister caught Ebola, and then his mother. I took care of her here in the village, and got Ebola myself. I went to the clinic in Koindu, which is eleven kilometres away. They treated me the way they treat cholera. They took a blood sample from me. After a week it was clear that I had Ebola. I was very afraid. Now I was sick and I thought I would die within 21 days. They took me to Kenema hospital - Sierra Leone’s only isolation unit for Lassa fever. I trusted the clinic in Koindu and I did not want to go to that hospital. I knew that Mercy, a nurse from the clinic, died there. And I was afraid that I would not survive the journey. And I was afraid that, if I died there, my people would never see my grave. I believed that I had Ebola. Ebola had already killed three households of my family but then doctors said there was no cure. There were no specialists for Ebola and people were dying everywhere. Now we have foreigners to help, but then there were no treatment centres. People were just left in the hospital and it was in God’s hands if you died or survived. The community did not let them take me to Kenema. They said: ‘It’s not Ebola, you can’t take her.’ I am very strong and after the treatment at the clinic in Koindu I could stand, so I decided to run away. I walked out of the clinic at 2am. Other people tried to escape like me. Their families carried them out. In the morning I caught a motorbike to try to cross the Guinean border but they brought me back. I thought the authorities would look for me, so I hid. I hid for two weeks in the bush. At night, I slept in an old storeroom. My husband decided to stay with me. He said: ‘She caught Ebola from my family and I will not leave her. If God thinks we should die, then we will die, but I will stay with her.’ He was like a father to me. He knew that I had Ebola, so he knew what to do: he stopped body contact with me. When I was sick at the clinic, everyone in his family died. He sat three metres away from me and talked to me to help me to be strong. He brought me food and Panadol. When he went away, he sent my mother to watch me. When I was in the bush, I had one cup, spoon and plate, which he washed with chlorine. He put the food on the ground near me. At first I could not eat; with Ebola you lose your appetite. I remember the first thing I wanted was pineapple. I worried about my children at home, and the family I lost. But I trusted God. After I survived in the bush, I felt God had saved us. I hugged my husband as I did before. Our relationship is stronger now. This page was last edited on 3 June 2016, at 09:51.